Plymouth First Decade: Are Gasoline Lead Additives Needed? At regular intervals the question “should I use a lead additive in my gasoline” comes up on a number of antique car discussion forums. The answer is, of course, “it depends”. For owners of cars with the Plymouth L-6 (flathead) engine, I believe the answer is no. First we should examine why lead was added to gasoline. I suggest that you take a few minutes and at least scan the Gasoline FAQ located at the Internet FAQ Consortium website. 6.13 Can Higher octane fuels give me more power? 8.8 Can I use unleaded on older vehicles? Fuels having an octane rating of not less than 70 are recommended. While it is not clear if they were refering to the octane rating from the motor or research tests or to the average of the two that are posted on gas pumps today, I defy you to find gas with that low an octane rating at any gas station in the US. Fortunately, using a higher octane fuel than needed does no harm. You are not likely to be using your antique car for towing heavy trailers at high speeds. Most valve seat recession is under high speed, high load conditions. All Plymouth L-6 engines came from the factory with hardened exhaust valve seat inserts. So basically any 1930s engine can run on modern unleaded fuel. The Plymouth engine of that era is even more suited to modern fuels as it is fitted with appropriate exhaust value seats. Modern gasoline additives are not kind to older rubber compositions. Your flexible hose from the frame to the fuel pump, your fuel pump diaphram and, possibly, the float valve tip in your carburetor may be destroyed by modern gasoline. 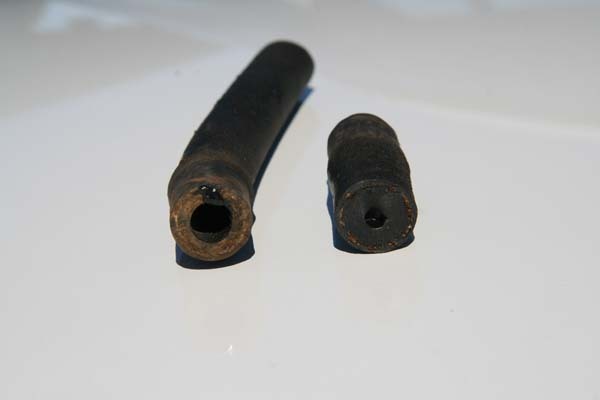 The image on the right (click for larger view) is of a piece of original fuel hose from a 1962 Plymouth Valiant where the son of the original owner attempted to get the car running again and filled it with new gas. The section on the left was unharmed as it was clamped over the steel fuel line. The section on the right shows the effect of modern gasoline. These are both from the same piece of hose. The hose was so swollen that nothing could get through. So replace your fuel system rubber parts with components made from materials that can resist modern gas. If you buy a vintage, new in the box, component like a fuel pump then rebuild it with modern materials before using it. You really don’t want to be playing around with gasoline issues near your hot exhaust manifold.